On May 16, 2018, about 1700 mountain standard time, a Zenith 701, N44CP, experienced a rough running engine on downwind leg for landing at a private grass strip in Jackson, Wyoming. The airplane sustained substantial damage and the private pilot received minor injuries. The airplane was privately registered and operated under the provisions of Title 14 Code of Federal Regulations Part 91 as a personal flight. Visual meteorological conditions prevailed for the flight, and no flight plan was filed. A Wyoming pilot credits a religion class he took decades ago for helping him survive two small plane crashes. Charlie Peet says his Zenith CH 701, an "off airport" plane, has decided twice that it "just didn't want to fly anymore." 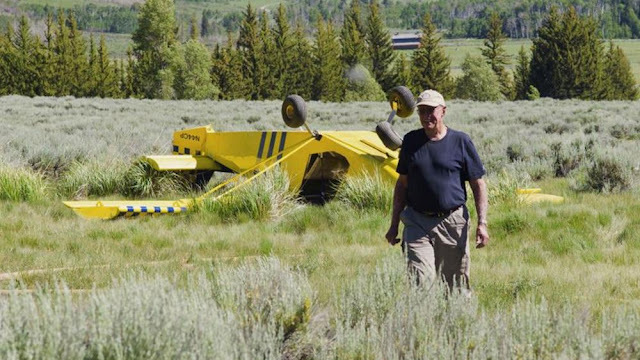 The first time, in 2013, Peet took off from his ranch and went up about 50 feet before the plane stalled and started to cartwheel to the ground. He walked away from that accident with only a broken ankle. Then on May 16th he took off from his driveway and noticed the engine wasn't running correctly. Peet tried to make an emergency landing but came in too hard. The plane was totaled, but he crawled out with just some cuts and bruises. His secret to survival: A tip taught to him in college by a Catholic priest. "God gave you your intellect, your ability, reason … in your mind you can solve your problems," Peet recalls. The plane crashes aren't the only time Peet has tested this advice. One Christmas Eve in Minnesota he was driving his car across a frozen lake when the tires crashed through the ice. He threw his son out the door but he got caught on the door handle and was pulled down into the icy water with the car. When the car hit bottom he freed himself and swam up to the hole in the ice illuminated by his cars taillights. But when he reached the top, he couldn't pull himself out of the water, because of how soaked through and heavy his clothes had become. That's when he again thought back to the words spoken by the priest: "There's a solution in the back of your mind, use it." Peet put one arm up on the surface of the ice, and let it sit there and freeze, then he did the same with the other arm, anchoring himself so he could pull himself up and out. "I pulled myself right out of the water. I picked up my son, and we got a ride home," he said. "You know the biggest killer we have is panic; it shuts off your brain," Peet said. "It stops you from thinking about what you should really be doing." While the tip may have helped him stay calm through some pretty dicey situations, his wife of 51 years says it's not much help to her. "I'm used to being in near-panic, living with Charlie," she said. 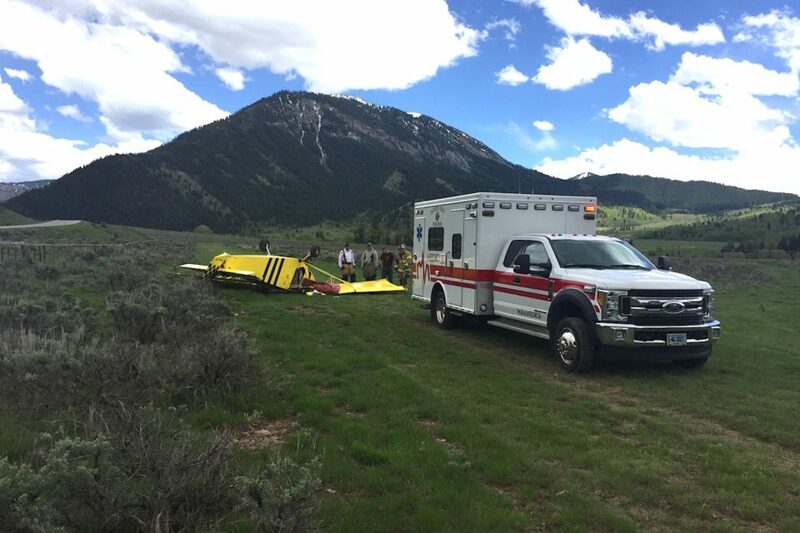 The pilot of a small experimental aircraft is OK after his plane crashed near Bryan Flat Road in the Hoback Canyon. Law enforcement officers were called to the scene a little after 3 p.m. Wednesday. The small yellow single-engine tail-dragger has the tail number N44CP, which is registered to Charles Peet. 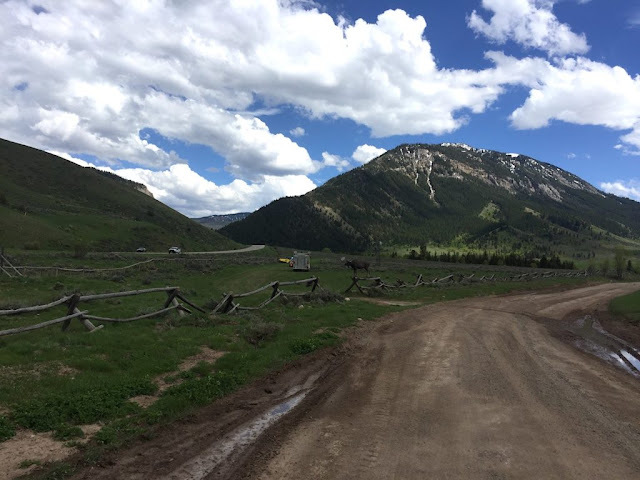 Teton County sheriff’s Sgt. Todd Staynon confirmed that Peet was reported to be piloting the plane when it crashed, marking the second time the plane, with Peet flying it, has gone down in the area. 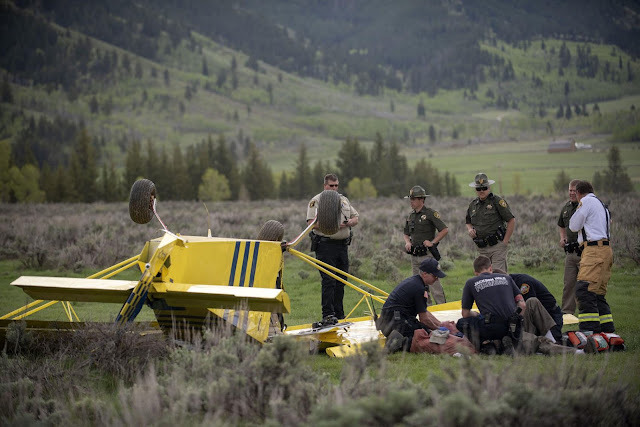 Nearly five years ago, on June 28, 2013, Peet crashed his experimental plane as he was taking off from the grass strip at his ranch, the Grumpy Moose, right where Wednesday’s crash happened. In a 2013 Jackson Hole News&Guide article, Peet’s wife, Marty Peet, said he had been flying since about age 15, and he was reported to be 80 then. Emergency officials said Peet was bumped and banged up, but otherwise OK and alert with no obvious life-threatening injuries. An ambulance transported him to St. John’s Medical Center. Staynon said the National Transportation Safety Board plans to send an investigator to the crash site. JACKSON HOLE, WYO – A light, two-person aircraft has crashed along Highway 191 at Bryan Flat. The pilot of the plane was not seriously injured and was transported by ground to St. John’s Hospital. The incident occurred at approximately 3:06pm. The yellow plane, with tail number N44CP could be seen upside-down near the iconic moose statue at Bryan Flat. It is a Zenith CH 701 single-engine fixed wing craft. The pilot has not yet been identified. The plane is registered to a Charles Peet with an address on Bryan Flat Road. If it was Peet and his Zenith, it is not the first time the plane has crashed. The 85-year-old crashed that same plane in June 2013 at the same place. He walked away from that wreck with only scratches. Peet built the kit plane some seven years ago. NTSB has requested photos of the scene for its investigation. The article describes the airplane, N44CP, as a taildragger but it's not.